TAMPA, Fla. — Five bids across the Divisions were up for grabs in the Southeast. While the Women’s and Men’s divisions provided little in the way of surprise or suspense, a wide open Mixed division did its best to atone for that. Here’s a look at what happened down in Florida. All season long, it’s been a battle for Atlanta Ozone just to get everyone on the field. Regionals was the first weekend in which they had their full roster, and that means it’s no surprise that they also played their best ultimate of the season. They outscored their opponents 82-27, including a 15-7 blowout of Raleigh Phoenix in the final. Ozone has shown glimpses of the team they could be through the regular season, but with all the players that missed time at one point or another, they struggled to put together consistent performances. But with everyone together, they were finally able to put together a complete tournament. While there may have been a mental transition for Ozone, it didn’t manifest itself in their results. They won comfortably in every game they played. But certainly their most impressive win was in the final against Phoenix. Defensively, they gave Phoenix an unsolvable riddle with their impressive zone defense. They forced Phoenix into low percentage throws and took advantage of mistakes with efficient D-line offense. They were able to put the game away early, going on a four break run to make it 6-2 and never looking back. Ozone clinched their fifth consecutive Southeast regional title without playing a game closer than 15-8. Phoenix didn’t have the final performance they would have wanted, but they did accomplish something more important: getting back to the Dance. No, they weren’t at their best against Ozone, and they didn’t play great in the second place game either. But they were strong enough to win that game against Florida Tabby Rosa 15-10 and return to Nationals after missing out in 2017. There was a hint of worry early in the game to go for Phoenix. They surrendered the first break of the game to fall behind 4-3. But Phoenix’s downfield defenders racked up blocks throughout the rest of the half, and their handler core was too strong for Tabby to slow down. The North Carolina club went into halftime up two breaks at 8-5 and stayed on top for the entirety of the second half. It wasn’t an overwhelming performance. Plenty of credit for that should go to Tabby Rosa, who established themselves as the clear number three team in the Southeast over the weekend. But Phoenix was without Jenny Wei, who went out during the Ozone game with a cramp, and they simply didn’t play to levels we’ve seen them hit this season. In fact, team captain Ashley Powell said the tournament was a “good reality check” and an indicator of some areas where the team needs to improve before Nationals. But the important thing for Phoenix was not letting a strong season slip away from them. They’re headed to San Diego with an impressive, young team, and that’s their biggest lasting takeaway from Regionals. Unsurprisingly, Raleigh Ring of Fire went largely unchallenged at Regionals. Their closest contest of the weekend came in the final, where they defeated Atlanta Chain Lightning 15-11. Other than a freak turn when the disc slipped out of Jonathan Nethercutt’s grip on a fake, Ring played flawlessly — literally, that was their only turnover. Chain’s collection of transition defenses did little to slow down the Raleigh offense, perhaps because Ring employs many transition defenses of their own. When you consider that Ring was without two O-line contributors in Jack Williams and Bob Liu, their success becomes even more impressive. For much of the tournament, they employed open lines to great success, averaging a positive point differential of 8.2. Coming out of halftime, Ring flattened their marks and forced Chain’s cutters away from the disc, taking away the short continuation passes that were working so well for the Atlanta offense. Chain’s shorter roster also had trouble defending Ring’s dominant big men, particularly Carleton College alum Henry Fisher, who put up a massive nine goals in the final. With another Southeast Regionals win, Ring kept the longest active Nationals streak alive.1 They’ve qualified every year since 1997. Atlanta Chain Lightning’s four-year absence from the fields of Nationals came to an end with their 15-10 defeat of the Huntsville Freaks in the 2nd place game-to-go. For much of the 2000s, Chain Lightning was a staple of men’s Club Nationals. However, as the core of their 2009 championship retired or moved on to northerly pastures, the team fell from its former glory. The team spent the last few seasons building around a younger core, and it’s finally gotten them back to the game’s biggest stage. It was fitting that the goal that clinched their Nationals berth was a connection between two rookies, Jacques Perivier and Will Lindquist. Although much of Chain’s roster has never qualified for Nationals before, head coach Miranda Knowles sees Chain’s youth as an advantage—all 25 players on the roster saw significant playing time this weekend. 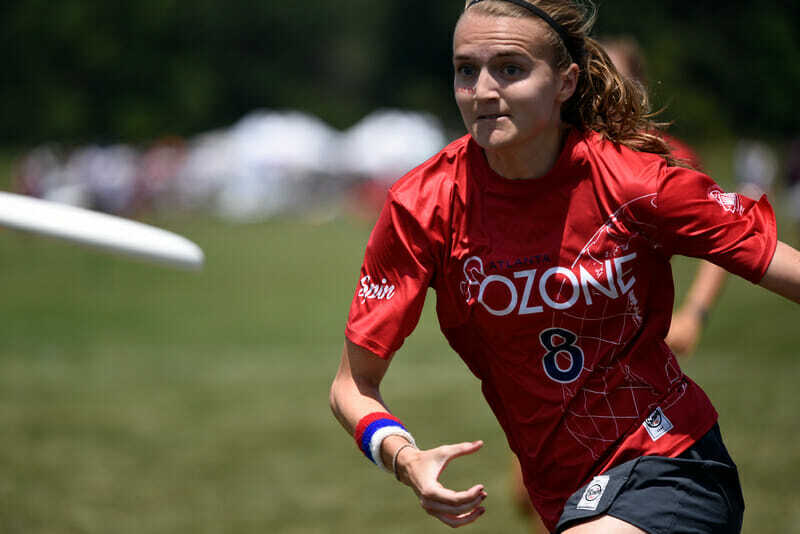 Knowles herself is new to the Chain program, but she has long been an important figure in Atlanta ultimate. Chain used that depth to take second place in the region fairly comfortably. Outside of the final against Ring, Chain was a dominant force. They handled their pool with ease, had no trouble with Tampa UpRoar in semis, and were on top the whole way in the game to go against Freaks. Just as Knowles intended, the Freaks offense struggled to pace themselves after the defensive adjustment, and Chain was able to claim their bid to San Diego. It felt like four or five teams could take the Southeast’s lone mixed bid this season. Ironically, those teams didn’t play many close games against one another — Charlotte Storm’s 13-12 win over Asheville Mixfits in quarters and Toro’s 14-12 win over Atlanta Bucket were the only two games played between the top five seeds that were decided by fewer than five goals — but it did create a palpable sense of importance and urgency in every game from quarters onwards, something the other divisions in the Southeast lacked. Ultimately, it was Durham Toro who claimed the trip to Nationals, defending their title as Southeast champions. Toro was never really tested for an entire game, either. Their closest scoreline, a 14-12 win over Bucket in semifinals, was only that close after Bucket scored three straight after being down 13-9. So Toro did have to weather a late scare, but they were the dominant team for most of that game, too. Outside of that game, their average margin of victory was seven goals. Toro used a consistent deep game connection between Tristan Green and Michael Pannone, Lucas Darden’s influential play, and the depth of their women to great effect through bracket play, and no team had an answer. They were especially dominant in the first half of the final against Florida Weird, when they turned it just once and took an 8-3, four break halftime lead. Weird clawed back a couple breaks late, but Toro easily won 15-9 to clinch their spot in the Nationals field. Toro was also strong defensively, particularly in the final, where they were able to mitigate Weird’s deep game. But where they most impressed was with their ability to score with both their offensive and defensive units. Part of that came from playing players like Green both ways, but it was still evident that Toro had more weapons on both sides of the disc than any of their opponents, and that’s why they are headed to Nationals for the second straight season. Comments on "Southeast Regionals 2018 Recap: The Favorites Sharpen Up, Chain Returns To Nationals"